I’ve always been interested in how the landscape at one end of a bridge can be so different from the other end. 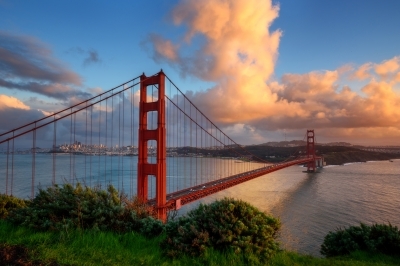 Perhaps the most famous example is the Golden Gate bridge in San Francisco. On the southern side, we have the large city of San Francisco and at the north end of the bridge, just 1.7 miles away, we have the more rural Marin County. I grew up in Washington state, and the same phenomenon exists with the Tacoma Narrows bridge (now two bridges). The city of Tacoma is on the east side, and just one mile across the strait is the much more rural Kitsap peninsula. 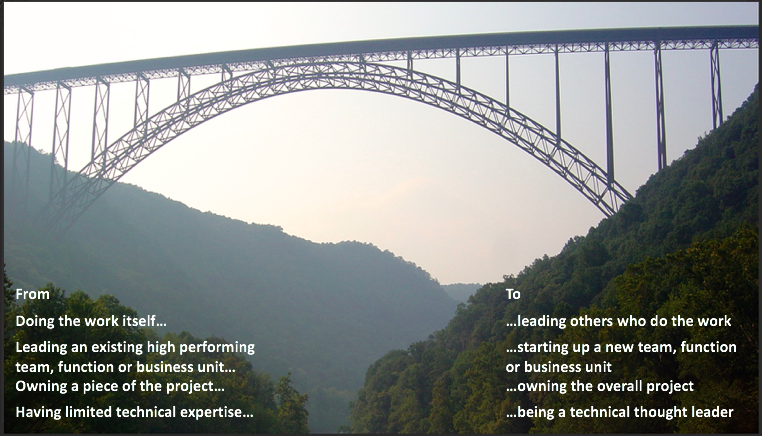 As leaders, we want to help our team build a bridge that leads from their current capabilities on one side to new or greater capabilities on the other. The first step is getting clear on what lies at the other end of the bridge. It’s hard to help someone build a bridge if they aren’t clear on where they want to go or why. Share what you see on the other side of the bridge. Help your team members explore possibilities, which might include a combination of gaining various work experiences, participating in different teams, engaging in networking opportunities, and taking some assessments to clarify interests and goals. The far end of the bridge does not have to be a specific job title or role. It may be a clarification on the type of contribution, as shown below. The second step is to outline what competencies, skills, knowledge or experience are necessary to be successful on the other side of the bridge. Be specific. Don’t just leave it at “you need to be more strategic”. Use a combination of tools such as a competency framework, skill profile, job description, role profile, interviews of past incumbents, or other sources to elicit specifics about capabilities that will ensure success. Next, put in place a few specific actions that will lead to the development of the necessary capabilities and create the roadway across the bridge. These may include a combination of educational programs, training, coaching, regular feedback, work assignments, and other experiences which expand capability. For more ideas about ways in which to develop, click here. Remember that actions should lend themselves to engagement, ownership and accountability. Finally, find ways to measure and acknowledge progress towards completing the bridge. With the right measures, it should be obvious if the bridge is being built correctly and to assess the pace of construction. Find time to check in, discuss progress, isolate and overcome obstacles and provide encouragement. Building a bridge, whether it’s across a body of water or from one set of capabilities to another, takes planning, hard work and commitment. However, if well-designed, the resulting product will be a masterpiece that will be admired and remembered for a lifetime. Future generations will be grateful that you took the time to build that bridge.